How do I love Kale? Let me count the ways! I love Kale today with fresh ginger and green onions. 1. Cut off the stalks from the leafy part of the kale. Set these aside to use for a green juice. Or chop into small pieces. 3. During this time, spread oil, if using, evenly on a heavy skillet or wok and turn heat to medium high. When hot, fry the ginger and scallions for about 2 minutes, stirring regularly. Add 1 tablespoon of water at a time if necessary, to prevent sticking Do not let the ginger burn or get too brown. 5. 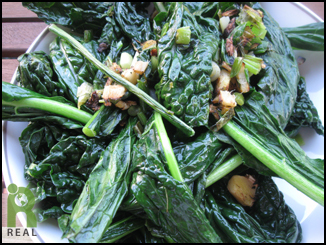 Toss and mix greens with the ginger and scallions. Cook greens for several minutes. Remove from heat. Serve immediately.